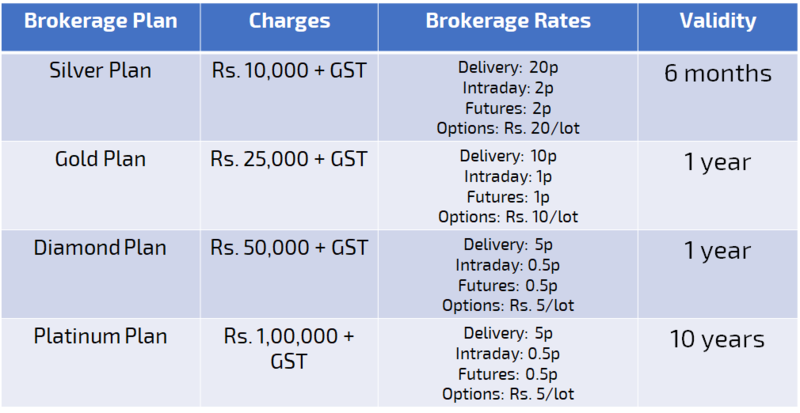 How do we reduce our premium brokerage rates at TradingBells? Our premium customers have the option to subscribe to our reduced brokerage rates which goes down upto 0.005% for Intraday & Futures and Rs. 5 per lot for Options. Please see below table for details. This is an excellent option for those traders looking to lower their brokerage rates and enjoy personalised premium services. That&apos;s not all, all our premium customers enjoy free call & trade facility as well as a dedicated RM to cater to their needs. The most popular plan is the Gold Plan where the brokerage rates are just 1 paisa, however the most beneficial plan is the Platinum Plan which gives you a validity of a full 10 years. This means you don&apos;t need to worry about your brokerage rates for a veryyy long time.